The key to reaching your personal and professional goals and living the life of your dreams lies in the power of confidence. If you don’t have it, don’t worry. Heather Monahan will show you how anyone can master the essential techniques to building confidence and becoming your best self. 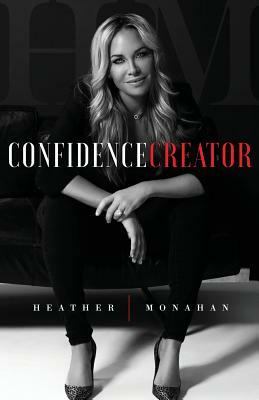 In Confidence Creator, Heather offers a resource she wishes she had when she was younger. Using personal stories from her life and career, Heather illustrates the tough lessons she learned along the way that helped her develop the self-assurance necessary for getting what she wanted in life. You’ll discover how to determine your number-one enemy, attract the right people, find your voice, and more. Whether you’ve never had confidence or have lost it due to a breakup, divorce, unemployment, or another one of life’s challenges, this book gives you the tools to take charge of your life and create your own confidence. Heather Monahan started from very humble beginnings growing up in Worcester, Massachusetts. After graduating from Clark University, she began her career in sales and quickly advanced to top salesperson and Brand Manager within her first year in corporate America. After being harassed in her position, she left the wine business and started working for Wilks Broadcasting as a salesperson in radio. A year later she was offered an equity partnership which required her to move to Saginaw, Michigan. Heather made the difficult decision to leave her family and friends behind and move alone to the Midwest for the chance to create value and potentially sell the Saginaw properties for a gain. Within three years in Saginaw, she significantly increased the group’s value resulting in a successful sale of the properties more than doubling the purchase price from 27M to a final sale of 55M. Heather then moved to Naples, Florida to begin working for Beasley Broadcasting where she started as a Director of Sales. After one year of substantial revenue results, she pitched herself for a position that didn’t previously exist and was awarded the VP of Sales title for the company. Over the next few years she pitched herself for and was awarded the newly created EVP Sales position and ultimately the Chief Revenue Officer title. During this time Heather launched her personal brand to empower women and give them the insight and tips she had longed for as a young professional. She was the Keynote speaker at the Corinium CRO conference and held the main stage at the LOAC in NYC. Heather was recognized as a Glass Ceiling Award winner and as one of the Most Influential Women in radio in 2017. After being terminated by another woman in July 2017, Heather became a full time entrepreneur. In 2018 Heather was named the Brand Ambassador for Perry Ellis International’s female brand Rafaella and Thrive Global named her a limit breaking female founder. Heather and her son Dylan reside in Miami, Florida.